The Lego Gang get their iPad! Many of us took fun pics of our pets looking at the box we got from Apple via UPS this month… they were more fun for the families than all the other iPad owners around the world. Then of course there was the endless unboxing images… we had so many, each team member treated it like they were the first to see the slate of join and had to record the moment in history. 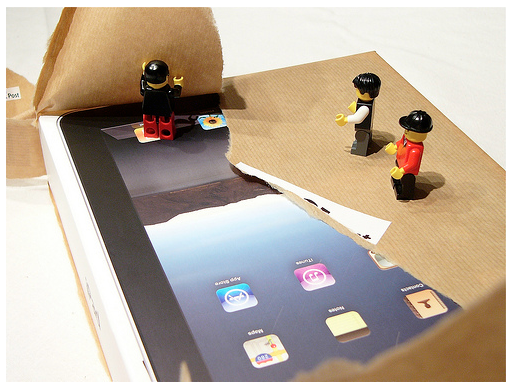 Three Lego guys received their iPad as well. And, lucky for us recorded the unboxing, posted up to Posterous for all to enjoy. The slideshow version is available on Flickr, but it is in Flash so don’t bother clicking on this link if you viewing via your iPad.